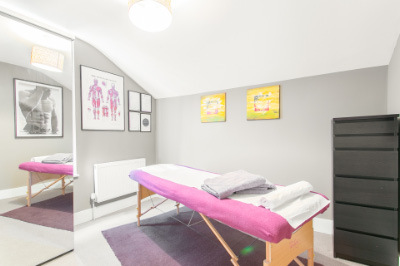 As a qualified professional massage therapist based here in Clapham North I am available to both athletes and professionals to provide massage therapy from my modern comfortable studio which I have purpose built within my home. I am fully qualified sports and relaxation therapist with a focus on consultative treatment to ensure that my clients are comfortable and relaxed to allow me to meet their individual needs. 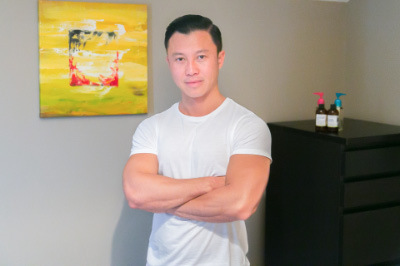 I became a massage therapist after many years of working in the corporate world and despite great success in that field I realised I wanted to help people directly and individually and enjoy the independence of working for myself. In my life I have always been focused on my personal fitness and during my regular trips to the gym I frequently observed others misusing weights and adopting poor posture so I decided that with my knowledge of the body, nutrition and general cardio vascular exercise could help people achieve better results and avoid injury. My pledge to every client is that I'll make every effort to cater for all aspects of their individual health needs to ensure they reach their highest expectation from our session. I am proud that my business has grown through recommendation and word of mouth and I feel that my personal approach allows me to build this incredible loyal client base who I develop a trusting and supportive relationship with that means that they come back time after time. Massage is the manipulation of soft tissue to relieve muscle tension and soreness. It involves working the soft tissues of your body using stroking and kneading movements with different pressures. what type of massage do you offer? I offer Sports and Swedish Massage therapies. I offer professional, clinical massage services only. These are different to what you might encounter in a massage parlour -- I do not offer a sensual or sexual service. It depends on the primary treatment being offered -- for a full body massage, most people undress completely. You may wear underwear if you wish. You will be able to undress in a private area, and your body will remain covered with a sheet at all times except for the area being worked on. what do I do during a treatment session? Just make yourself comfortable. If you need to change your position you may simply do so. Some people prefer to lie quietly during a session; others prefer to talk. It's up to you. Do not hesitate to ask questions. how will the massage feel? A massage session begins with broad, flowing strokes (effleurage) which will help your nervous system relax and reduce any exterior muscle tension. As your body becomes more relaxed, I will carefully increase the pressure to relax specific areas that are tense. I use a light oil to prevent excessive friction on your skin. This oil washes off easily afterwards. Most people feel very relaxed -- even sleepy -- initially, followed by a period of increased energy and heightened awareness, which can help boost productivity and may last for some days. You should drink plenty of water after a massage session, as your body releases toxins during the treatment and by drinking water you help your body get rid of them. how often should I be massaged? Many of the effects of massage are cumulative. They add up over time. Many people take a massage every 1 - 6 weeks. Some people just have one whenever they can find the time. For acute problems such as overwork or muscle spasms you might want to come in weekly or even more often. Please don't feel pressured to tip, though obviously feel free to do so if you want to. Please give me 12 hours' notice if you can. What Does Neck and Shoulder Pain Feel Like? Acute pain may cause abnormal neck posture - the head is forced to turn to one side. Sports massage is an intensive deep tissue treatment that offers benefits to all kinds of athlete, to treat as well as prevent injury. The pressure used is carefully tailored to the needs of each individual, taking into account their preferences and tolerance levels. Train harder for longer and get fitter faster! I have been administering sports massage therapy for a number of years and am very experienced. The classic massage experience, designed to relax, restore and re-energise the whole body. Just the thing after a long, stressful day. Why not treat yourself to one today? I have been administering Swedish, relaxing massage therapy for a number of years and am very experienced. A fantastic massage. As someone who needed a proper sports massage, not a relaxing experience this was perfect. Would highly recommend. Felt the benefits immediately. Very attentive and very powerful! Brilliant sports massage - definitely the best I've ever had! Another great sports massage! Stanley is super friendly and knowledgeable, after having a bad back he has given me some great tips to get back on track - highly recommend! Great massage, very relaxing atmosphere, I will definitely come back. I visited Stanley after taking part in an endurance race, to help my muscles recover. Although the massage was painful, I felt the benefits immediately and continue to feel them - my muscles have recovered so much more quickly than after previous races. Stanley was professional and knowledgeable and gave me good advice about how to help prevent injuries and take care of myself. It was an excellent massage and Stanley provided great advice as well. The only reason the ambiance only has 4 stars is it would have been better if the music was on a speaker. Perhaps the music would have helped relax me more during the deep tissue parts of the massage. Miracles - Stanley works miracles! Brilliant sports massage. Can't recommend Stan enough, I would definitely go back. He really takes the time to find out what your issues are and is very thorough. Wonderful - left feeling like a new person. Thank you Stanley! Fabulous massage, very effective and relaxing. Lovely venue. Amazing massage - actually got into the many tight spots! Thank you Stanley. I will be back. Brilliant as always!! Thank you Stanley!! Very good massage with alot of pressure. I wish more massage therapists were as thorough. Excellent treatment which is proving a great help in recovering from an injury. Stanley is very professional and I will continue to use him. Stanley worked wonders on my knee. I have an ACL injury and have been seeing a physio for 8 months. This was an excellent treatmaeny. Felt great for days afterwards! Stanley is extremely professional and kind. He makes sure he understands exactly what you're looking to get out of the massage, and the massage itself is amongst the best I've ever had. My back feels a lot better already. Really happy with the service received here. Stan is very welcoming and throughout the massage he was able to tell me a lot about my body, and give me good advice. It helped with a knee injury I've had for a while and I will be back soon for another massage! :) Thankyou! I was really pleased with the service and massage I received. Stan is very friendly, an excellent masseur, very knowledgeable and welcoming. The room is lovely and clean. I left feeling much better and have noticed improvements in my flexibility and general feeling. I will definitely be back and recommend him highly. Best deep tissue/sports massage I’ve been able to find in London. My experience was extremely positive. This is not the first time I go there and the service has always been at a very high standard. I booked my first Deep Tissue Massage at Bodyzone to try and remedy some back and shoulder discomfort I was experiencing from weight training/carrying too much around London. The venue was clean and relaxing and the team were very professional, explaining the treatment and after care. The massage itself was a bit painful but well worth it as I walked out feeling as light as air. I'd happily recommend Bodyzone. As a runner and cyclist and generally active person, I've had loads of sports massages over the years to help with injuries and sore spots. Stanley gave me one of the best sports massages I've ever had - firm, vigorous, and really effective. It was genuinely excellent. I felt so much better and freer afterwards. Thanks heaps. Stanley is a superb masseur. If you like your massage very strong, then he is the right person to help you. His fingers and hands are tremendously strong and his technique is excellent. I have lots of and shoulder pain but after a session with him, the muscles are relaxed for quite some time. He's pleasant, reliable and his fees are highly competitive. I recommend him without reservation. Stanley is totally professional. He is charming, attentive and very knowledgeable about the body. I train in a gym and rely on Stanley to sooth, manipulate and advise me on maintaining my health through his extraordinary massage. I cannot recommend him highly enough. Stan's hands are the best. I came to him for some work on a recurrent back problem caused by a mixture of desk work, travelling and heavy lifting in the gym. Stan has incredible body knowledge, observation, and intuition, so I felt like he knew my problem very quickly, and he had an immediate effect. His sports massage treatment has removed the tightness and pain in my back, but has also had a wider impact on my flexibility and posture. It's great when you know you are with an expert, and I can recommend Stan absolutely as an expert in his work. Stanley's massages helped relieve my migraines. He has great technique - firm, strong and confident. I work in IT and suffer a lot of tension in the neck, shoulders and upper back. Stanley's treatments really helped relieve my tension. Amazing Stanley! Stanley's treatment definitely helped my lower back and posture problem . The whole experience was very professional and I felt the difference immediately. I recommend him without hestitation. I hurt my left arm and shoulder doing the gardening. I also had to stop going to the gym for 8 months. After sessions with Stanley, when he gave me sports massages and Swedish massage over 3 months, I have really felt better and I intend to continue having my massages with him. 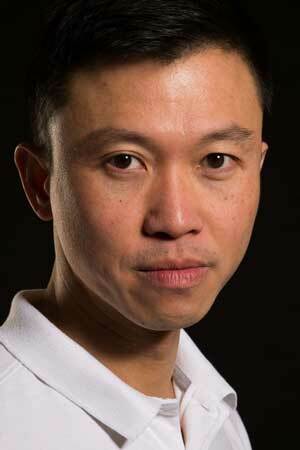 I am very happy to recommend Stanley Tan and Clapham Bodyzone. From my first visit, Stanley gained my trust by providing a thorough initial assessment of my needs and lifestyle and what I wanted from a sports massage. In my regular visits since his clear knowledge of muscle function and structure keeps my lower back and shoulder pain well under control. A professional, bespoke and friendly service provided in spotless premises. I would strongly recommend Stanley for quality massages every time. I have many sports injuries and Stanley seems to find the right way to alleviate all significant pain. I have injuries in both my shoulders, knees, back and neck. Stanley has a very scientific and interested approach in everything he does so he just seems to know exactly where to manipulate each problem area to reduce inflammation, movement restriction and any pains and aches. Every time I have treatment by Stanley I am guaranteed a great sleep and more relaxed following day. The difference he can make is not superficial it significant and good for the long term. I work out at the gym with Stanley and he is very controlled in all exercises and has helped me by instructing me how to work out properly explaining how doing it right will reduce the pain and improve my body in the long term. I will be continuing with my regular sessions with Stanley. You have a very strong but gentle touch and manage to put the pressure exactly where it is required. This being a home-based massage service, I came with a little apprehension but left an extremely satisfied customer! Not only is Stanley professional, he is excellent in his massage skills. He listens attentively and exerts the right amount of pressure at the problem areas while still making the overall massage very relaxing for the mind and the tired body. Besides, the massage environment is clean & tranquil in a neighborhood easily accessible by tube. I will definitely return for another soothing massage in this gem of a find in Brixton!